French painter, draughtsman, miniature painter and engraver. He studied drawing with his father Jean Cotelle I (1607-76), an ornamental painter at the court of Louis XIII. He went on to learn miniature painting with Elisabeth Sophie Chron and portraiture with Claude Lefèbvre. He spent the years 1662-70 in Rome under the protection of Anne, Princesse de Rohan-Gumne, and in 1672 was received (reu) by the Acadmie Royale as a miniature painter on presentation of the Entry of the King and Queen into Paris (untraced). 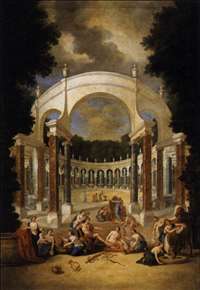 In 1681 he painted the Marriage at Cana (untraced) as that year s May (the picture commissioned annually by the Paris Goldsmiths Corporation for the Cathedral of Notre-Dame). His portraits are now known only through engravings, such as that of the Princesse de Rohan-Gumne made by Franois de Poilly I. 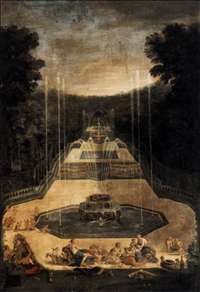 His reputation rests, however, on the series of 21 views of the chteau of Versailles, its gardens and fountains that he painted for the gallery of the Grand Trianon (Trianon de Marbre). 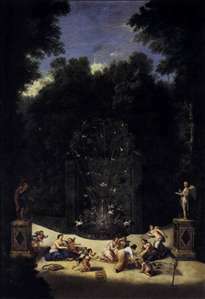 This series, completed by three further views by Etienne Allegrain and Jean-Baptiste Martin I, was finished in 1691 and remains in situ. 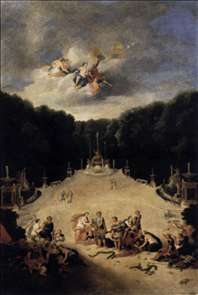 Although the landscapes are in the Flemish realist tradition that informs much 17th-century French topographical painting, the perspective is distorted in a way reminiscent of theatre designs, and the foregrounds are populated with representations of the loves of the gods in a style close to that of Alessandro Albani. The strange effect of this combination of the realistic and the mythological is less obvious in the surviving gouache modelli (Versailles, Chteau, and Paris, Muse des Arts Dcoratifs). These remarkable paintings, with their original sense of colour, are works of some quality, which makes the loss of the greater part of Cotelle s oeuvre all the more regrettable. A few engravings from his hand survive, including a suite of decorative designs for fire-dogs. 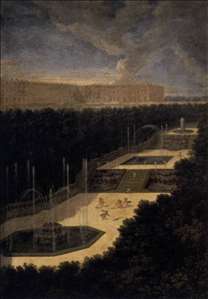 See more details about "View of the Colonnade at Versailles"
See more details about "View of the Three-Fountain Grove"
See more details about "View of the Arch of Triumph Grove"
See more details about "Entrance to the Maze"